A miraculous break in the heat-wave created near perfect weather for riding through the Philly suburbs. Other than one unexpected obstacle, the reverse, revised, and nearly detour-less river to river route provided a fun day on the bike. 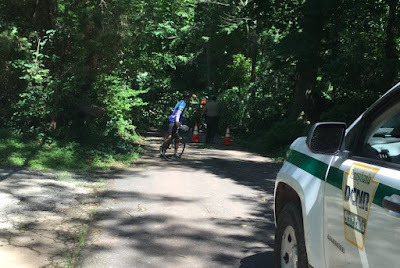 Preliminary results have been posted at the PA Rando web site. Results will be submitted in a couple of days to RUSA, and then become final pending ACP certification. A total of 21 out of 21 riders finished in good time for a 100% completion rate -- congratulations and well done to all! First finisher Scotty S set the YARRR course record with his 7:47 minute effort, with Don J and Tim C in under 9 hours and also beating the previous record. That's quite an achievement for a course with so little flat, straight road. The shock wave of their passing through may have downed a tree in Evansburg State Park. Although it's not proven that the force of Scotty, Don, and Tim's wake was the cause, the tree did, in fact, fall sometime during the day of the ride. Early finishers did not encounter it and it was not down during either of the pre-rides. Riders that were blocked used a variety of strategies to get around. Some bushwhacked through the adjacent poison ivy, some slogged through a muddy horse trail, others reversed course and logged some bonus miles in a roundabout road detour. Because of the electrical wires entwined with the branches, most riders wisely kept their distance. As a general rule, this is the approach to possibly electrified downed trees. Rule, or more like guideline? Fixed gear rider Joe D, along with fellow Sinister Nut, Guy H, made a careful evaluation of the wreckage and weighed the risks. They chose to ignore the warnings of nearby "ranger Rick" and simply went through the tree --- with no problem. Very interesting. A modification in this year's edition of YARRR included more of the Saucon Rail trail, eliminating some climbs around DeSales University. This new section of trail currently requires navigating a town park, which can be a little confusing. Most riders didn't require nav assistance from the secret controle volunteer. All riders eventually made it through. We understand that plans are in the works for a trail bypass to be built that will eliminate this confusion in the future. Congratulations to James H who pre-rode the route the prior weekend when it was nearly 20 degrees warmer. His finish completed his second PA-R12. James has a string of 24 consecutive months with PA Randonneurs event completions. Chappeau, James! Next up is the RUSA 20th Anniversary ride on August 18. Registration is open. Watch this message board for additional details.